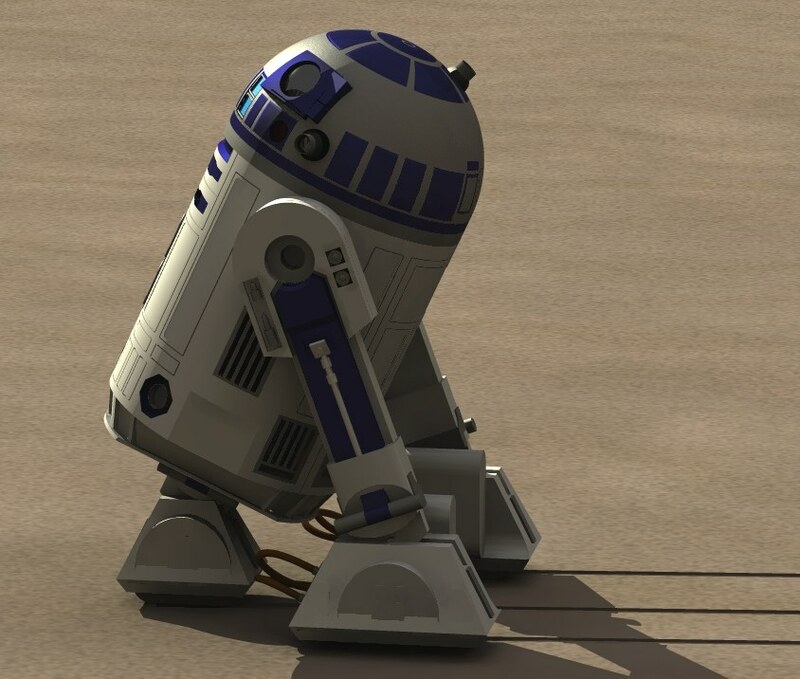 A detailed model of R2D2. Here, too, the thumbnail does it no justice, so check out this image (110K). Requires MegaPOV and a number of plugins to render! By Ryan Constantine. 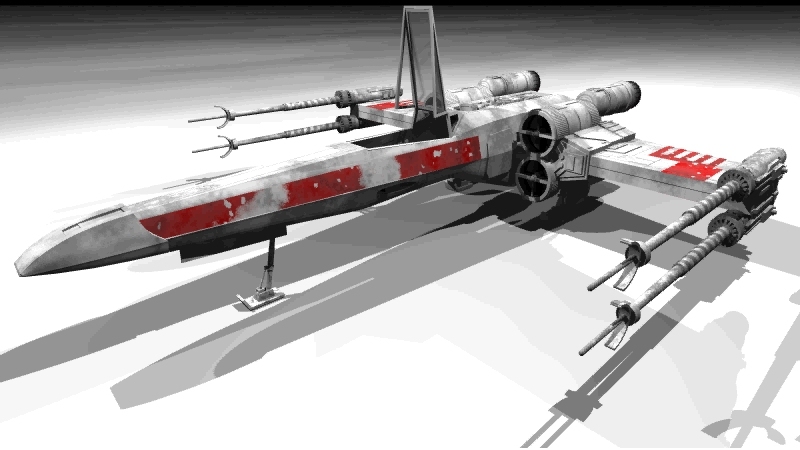 An updated version of the incredibly detailed, animatable, wonderfully textured model of an X-Wing fighter. The thumbnail does it no justice, so check out this image (146K) and this image (107K). Requires MegaPOV to render! By Ryan Constantine. This is model of a 35-ton Omni-Mech Uller with a high detail-level. Check out this bigger image (51K). By Jan Fischer. A SCRP-12A Scorpion Mech. Made in sPatch and textured in Moray (long parsing times). By Jan Fischer. A Mad Cat Mech as used by Clan battleforces. By Jan Fischer. The EVA Pod from "2001: A Space Odyssey. Very detailed, the arms can be made to move. (IK is not setup, but is easily added). By Mike Fitzpatrick. A surgical unit similar to the ones seen in Earth: Final Conflict. Inverse Kinematics are setup correctly. By Calle Laakkonen. A model of an Atmospheric Shuttle as seen in Babylon 5. By Steve Sloan. A model of the transport craft for the President of the Earth Alliance from Babylon 5. By Steve Sloan II. A model of the interstellar passenger liner Asimov from Babylon 5. By Steve Sloan II. A scene with a model of the Babylon 5 Spacestation and Epsilon 3, the planet it orbits. Fully textured. By Steve Sloan II. This is a model of a Type 6 Shuttle (Goddard) from the U.S.S. Enterprise NC 1701-D. Very good CSG modelling with interior. By Mathias Raasch. This is the Comet spaceship to Captain Future, a 80's TV series. By Theodorich Kopetzky. A probe for Deep Space. By Andriea Valina Ashio. A futuristic tank, modelled so that it is easy to animate the parts. By Kayputk. 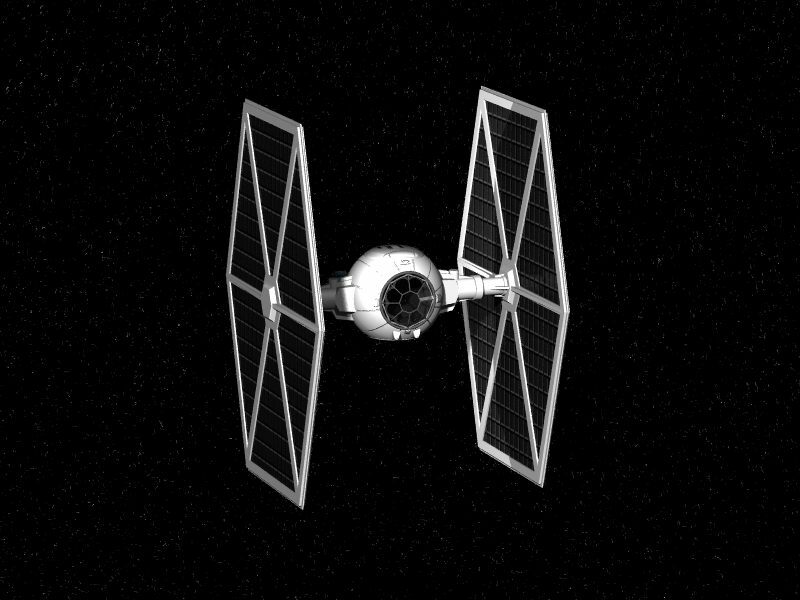 A textured model of the Sienar Fleet Systems MkI TIE-fighter. Bigger image here(69K). By Jakob Trendel. A textured model of a fighter spaceship with 4 engines and 2 pilots. By Kayputk. A detailed, textured model of a armored attack vehicle that is joined in the middle. By Kayputk. 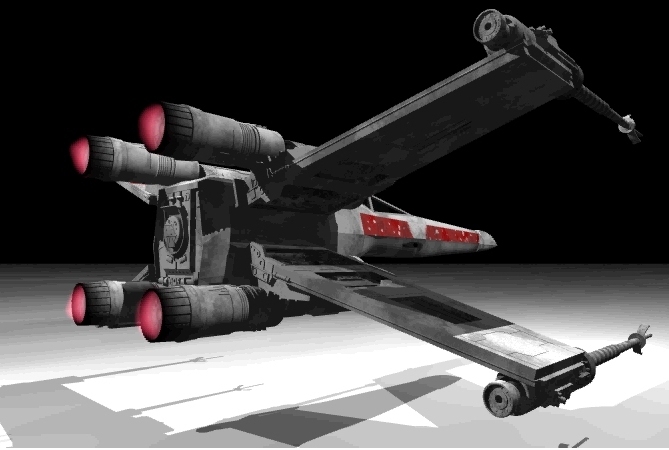 A detailed, textured model of a scout aircraft with 3 turbofan jet engines. By Kayputk. A model of a rocket-powered unmanned lander. By Kayputk. A DS-9 Space Station. By Orion Wilson. 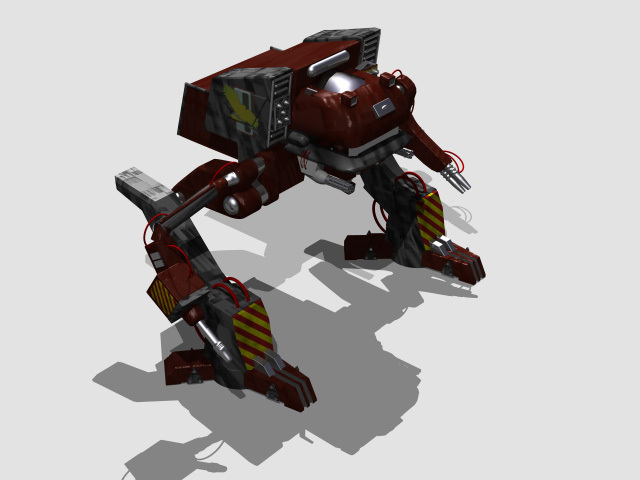 A Mech from Earth Siege 2. By Orion Wilson. A self-designed Mech. By Orion Wilson. A new (5th June 97) version of the USS Defiant. By Taura Learfox. A Borg spaceship. By Taura Learfox. A DS-9 Space Station. By Taura Learfox. The USS Defiant. By Taura Learfox. A Cardassian Galor Class ship. By Taura Learfox. A JemHaddar Warship. By Taura Learfox. A Klingon Attack Cruiser. By Taura Learfox. A Klingon Bird of Prey. By Taura Learfox. A Klingon Freighter. By Taura Learfox. A Klingon StarBase. By Taura Learfox. A Maquis Raider. By Taura Learfox. A Federation Nebula Class. By Taura Learfox. A USS NightHawk Federation Ship. By Taura Learfox. A Federation Danube Class Runabout. By Taura Learfox. A Klingon Vortcha Class. By Taura Learfox. The USS Voyager. By Taura Learfox. A Vivacious Vixen II Freighter. By Taura Learfox. Various StarTrek Models. By Taura Learfox. All of Tauras StarTrek Models (except the latest USS Defiant revision) listed above in one package. By Taura Learfox.